This Operating System Restore procedure is only for Windows NT, 2000 & XP. For Windows 95, 98 & ME click here. These instructions are for Windows 2000 Professional, Windows 2000 Server, Windows XP Home, Windows XP Professional, Windows XP Media Center and Windows Server 2003. We will refer to these operating systems as Windows XP in the following article. The Windows 95, 98 & ME Emergency System Backup runs under the DOS operating system and is not suitable for restoring Windows XP. There are additional problems when restoring Windows XP because of the improved control these systems have over their operating environments. Windows XP uses a file protection system which automatically restores system files if they are replaced by a third party program such as AISBackup. Windows XP also knows which physical disk it is installed on, changing the physical disk or partition will in most cases mean that the PC will not start properly (XP may hang and 2000 may go into an infinite login loop). AISBackup uses techniques to enable the restore of a working copy of Windows XP to a different drive or partition, it can also replace system files on the running copy of Windows by restoring to a temporary folder and then replacing the existing Windows folders with the restored folders using the Microsoft Recovery Console (or an AISBackup add-in to BartPE). AISBackup may also be able to restore Windows XP over the top of the running copy of Windows as long as the core operating system files are not different between backup sessions. AISBackup displays a message stating whether a restore may be made over the top of the running XP system, however, the Microsoft Recovery Console method can always be used (or the BartPE add-in). If the core operating files have been replaced between the chosen restore point and the current operating system then the restore method choice dialogue requests that the recovery console method is used, other wise you may choose between 'over the top' or recovery console method. As mentioned above, if the pre-installed environment BartPE has been set-up with the AISBackup plug-in then this method may be used to restore the backup instead of the Microsoft Recovery Console. If AISBackup defaults to Normal then the restore is completed by restarting the PC. The choice remains because the Recovery Console / BartPE method is more secure if there is power loss during the restore as AISBackup duplicates the Operating system on disk - and then swaps them with the Recovery Console or BartPE. An alternative method is to restore Windows from an AISBackup using what is known as a pre-installed environment, however these only work in Windows XP and Windows Server 2003. A pre-installed environment enables a cut down version of Windows XP or Windows Server 2003 to be booted directly from a CD or DVD, see here for more details on setting up a pre-installed environment. The Microsoft Recovery Console can be found on the Windows installation CD, if you would like to install the Microsoft Recovery Console onto your PC see here. If your PC did not come with an installation CD computer manufacturers normally install a folder called I386 which contains the recovery console. AISBackup is able to install the Recovery Console so that it may be selected during the boot cycle by using the Tools / Install Recovery Console menu option. If the backup is on CD using a packet writing system you will have to install the packet writing system, or at least a compatible UDF reader, before you can perform the actual restore. If the backup was made using the integrated AISBackup Disc writer or using a third party Disc Mastering program then the Disc's can be restored from without using additional software. Some other backup devices may require additional software to be installed prior to restore. The original disk is no longer available, you have purchased a new disk or re-formatted the existing disk, see here. The existing Operating System is still running but you wish to restore back to an earlier date, see here. The Existing System is running okay but you want to restore an existing backup or copy the running operating system to another drive or partition, see here. Restoring to a new drive (No Operating System Installed). Windows XP may only be restored via a compatible Windows system, DOS is not suitable. Usually the only way to do this is to restore via another compatible PC system (install the disk to be restored to into another PC, or an external USB or FireWire caddie for the restore) or re-install Windows and the restore over the top of this running system, this is described below. There is a third alternative for Windows XP users, this is to create a cut down version of Windows on a bootable CD or DVD, this may be done via a third party product called BartPE, for more details see here. The first step is to install a new copy of Windows 2000 or XP from the installation CD. You may want to consider setting up a dual boot system (2 separate copies of Windows 2000 and / or XP on the same disk). If you choose to opt for the dual boot system we recommend that the new install of Windows is made to the end of the disk. This is achieved by creating two partitions on the drive, the first (total size minus 2GB) and the second at least 2GB for Windows XP. You may choose either FAT32 or NTFS depending on your own interpretation of the recommendations made my Microsoft, if the previous installation was NTFS then choose the same or some attributes such as compressed folders will be lost. You may wish to install just the one operating system using the whole disk, this is okay but requires an additional restore step, see below. The easiest way to install a new copy of Windows is to boot from the installation CD. If your PC has not been set-up to boot from a CD, see the CMOS settings in the PC documentation. The following screen shows the Windows 2000 installation screen for creating and deleting partitions. The second (D: drive) partition has been selected, press ENTER to install Windows 2000 on this drive. unpartitioned space on this computer. Use the UP and DOWN ARROW keys to select an item in the list. � To set up Windows 2000 on te selected item, press ENTER. � To create a new partition in the unpartitioned space, press C.
� To delete the selected partition, press D.
Before the restore phase it is worth making a boot diskette just in case the restore is interrupted for any reason, such as a power cut, otherwise you may have to repair the boot menu files using the Microsoft Recovery Console. Use the menu option Tools / Copy Boot Files to Bootable Diskette. This diskette also serves as a backup of the boot menu files. Once Window has been set-up boot into it, install AISBackup, any required drivers, and then restore to the larger drive the complete Windows backup. As the existing Widows system will not know about the backup you should use the Tools / Open Job from Backup Media menu option. Choose a dated session, not All Sessions, enter the destination drive letter if it is not the same as when the backup was made. Restoring over the top of the running Windows system. 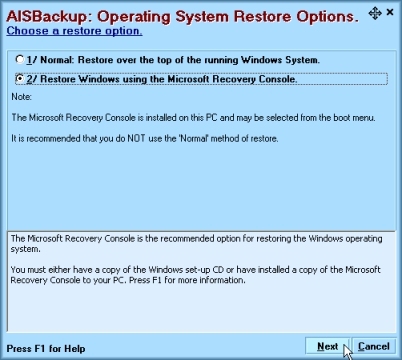 If you chose not to install a dual-boot system the restore process may have to be completed by using the Microsoft Recovery Console, see here. If the original Windows was from the C: drive (boot drive) then the boot menu files will have been restored from the backup, this backup does not know about the new dual boot system. To update the boot menu use the Tools / Edit Windows Boot Menu option and move the new menu item by selecting the menu item from the Additional Operating Systems list and clicking Add to Menu, if you want to change the displayed name of this system double click its entry in the menu list. The menu item you have just moved is for the Operating System you are actually running. If you are restoring an older version of Windows from a newer version of Windows to the boot drive C: (e.g. Windows 2000 from Windows XP) you will not be able to boot into the newer version of Windows using the older boot menu files, if this scenario is true place the boot menu diskette created earlier into the diskette drive then select the menu option Tools / Edit Windows Boot Menu. Select the Boot Menu Drive A:\ then click the button Copy. Select the destination C: then click OK. Select the newly restored diskette menu by choosing Boot Menu Drive C: then add the newly restored Windows 2000 boot menu to the list by using the Add to Menu option. Restoring over the top of the running system. To restore over the top of the running Windows system select and restore all files and folders from a dated session, do not use All Sessions. Run the restore as normal (see here). The restore may have to be finished using the Microsoft Recovery Console (or BartPE), see here. It is possible to restore an operating system that runs under a different drive letter over the top of the existing operating system, however, after re-boot the drive letter will revert to the restored system's drive letter. Format the new drive or partition, perform the restore of the existing operating system backup by choosing a dated session and not All Sessions. If you want to clone the running Operating system choose the menu item Tools / Copy Disk to Disk, select the current drive as the source of the copy, choose the destination drive. If you think you may want to repeat this process create a backup job of type Disk to Disk Copy instead. Files will not be copied if they are opened exclusively, these are normally log files but may also contain some Microsoft index database files. The skipped files will not prevent the cloned Windows system from booting. You may wish to exclude exclude the folder System Volume Information from the disk to disk copy. Once the restore or copy has completed the new Operating system should be added to the existing boot menu. The menu file may already be up-to-date if this is a repeat copy or restore, if so, skip the next step. To update the boot menu use the Tools / Edit Windows Boot Menu option and select the newly copied or restored operating system from the Additional Operating Systems list then click Add to Menu, if you want to change the displayed name of this system double click its entry in the menu list.